On Saturday, September 15, 2018, Heritage Saskatchewan celebrated the launch of the Val Marie Elevator Living Heritage Project. The standing-room-only event included a screening of short films created by high school students from the local school (as well as a short documentary featuring interviews with the students themselves) and a launch of a booklet produced by Heritage Saskatchewan in collaboration with the Val Marie Heritage, Culture and Youth Grain Elevator Restoration Committee and the Village of Val Marie. There was also a wide array of refreshments, with everyone clamouring to get a slice (or three) of homemade, eleven-grain bread! 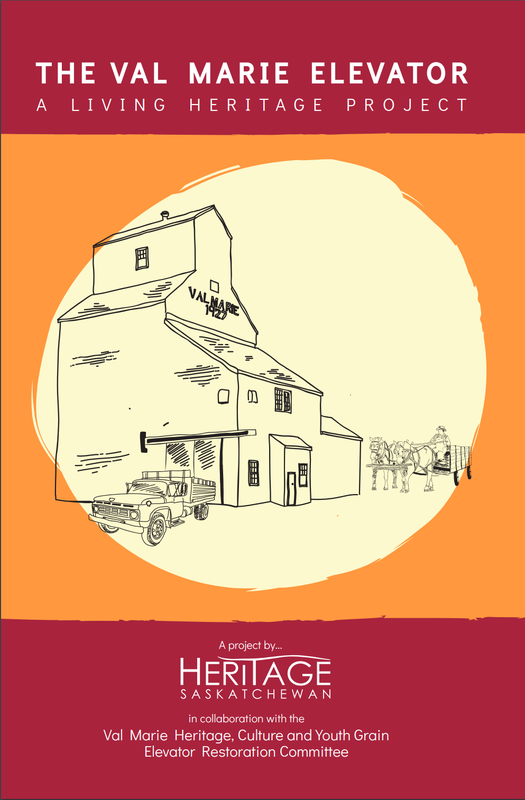 Read the complete Val Marie heritage elevator booklet here! The students of the Val Marie School produced a series of short video documentaries as part of our Living Heritage project. The videos are available to watch on YouTube at the link. In 2010, Bill MacFarlane was in Val Marie and produced this YouTube video about the Val Marie Elevator. In it, he interviews our friend Maurice Lemire, the driving force behind the community’s efforts to restore and safeguard the elevator. This video was shown at the Living Heritage project launch in September 2018. It shows just how remarkable the efforts of the committee were to restore the elevator, and just how much a small community can achieve!